Jobsoid allows you to create templates to automate your email communication to candidates as well as your contacts. 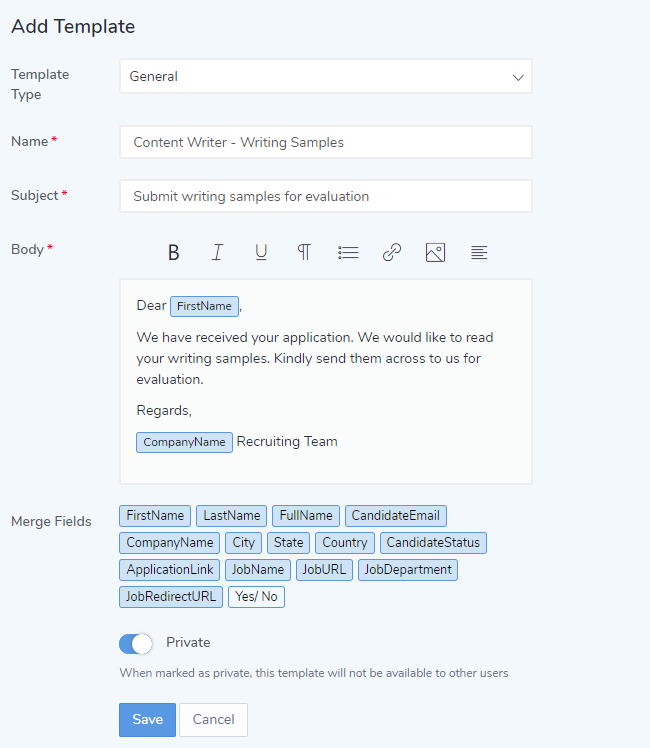 You can also use these templates to manually send out repetitive emails to candidates or automate them by configuring your hiring workflow. Save your email messages as templates. This is to quicken your email sending process and ensure seamless communication. Interview - Interview template is used to send out interview invites to candidates. These will typically send out a confirmation link for candidates to confirm the interview online. Workflow - Workflow templates are used for Autoresponders and Engagement emails. If attached to a Pipeline stage, an email can be sent out automatically when a candidate is moved to that stage.